Bring you patience if you are headed to San Francisco this weekend. Between baseball games and boats on the Bay, Caltrain is warning riders to expect packed trains this weekend. The San Francisco Giants will play the Atlanta Braves at AT&T Park through this weekend while boats compete on San Francisco Bay in the America's Cup World Series Regatta. Caltrain will operate the extra service it provides for all baseball games, but will not have additional service for America's Cup, spokeswoman Christine Dunn said. Those traveling to and from San Francisco should anticipate crowded trains and consider all transit options when planning their trip. Transportation information is available at 511.org/Americascup. 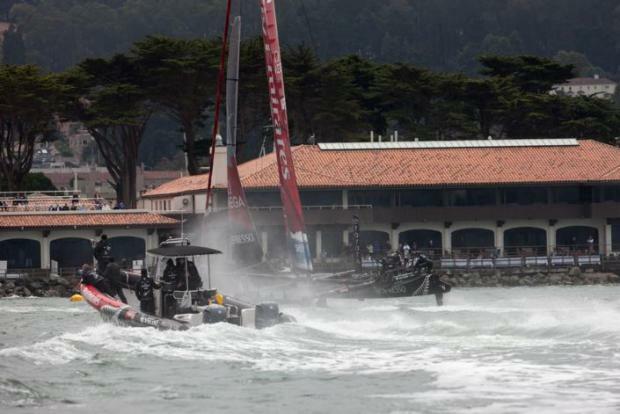 America's Cup is underway. It's Day 3, and the catamarans will be racing again. Bob Redell reports. The last train leaves San Francisco on Saturday at 12:01 a.m. and on Sunday at 9:15 p.m.
Tickets can be purchased at station vending machines or by using a Clipper card. Riders can avoid lines at vending machines on the return trip by buying a Day Pass. For information on Caltrain schedules and fares, go to Caltrain.com or call (800) 660-4287.